How Squats Are Superior To Leg Presses! Many lifters will actively switch out squats for leg presses in their routines. While both these exercises work the quads, they are not created equal. See why squats are the better choice. A number of personal trainers, strength coaches and gym rats advocate the leg press over the squat for perfectly healthy athletes because of the risk-to-benefit ratio and increased performance. After analyzing this I wondered, is the leg press really safer than the squat? Which has more transference to athletics, the leg press or the squat? Let's find out what common sense, science, and anecdotal evidence have to say. The leg press, regardless of design, has a preset motor pattern determined by the manufacturer. This motor pattern may not be ideal for your individual body type. It is built for the average person, and there is no real adjustment for body structure. Very few people would fall into what the manufacturer considers an average person. Consequently, you may condition postural and movement dysfunctions. The leg press has been shown to make athletes more prone to lower-back problems, because at the bottom position, they are deep into flexion. The knees get close to the chest, and many times the back is raised off the pad.13 This is common, and leaves the spine susceptible to large compressive forces.13 Because the leg press is built to optimize leverage and there is no stabilization involved, much more weight is used than with a squat, making the compressive forces in this unnatural position with heavier weights potentially much more dangerous. Because the stability factor has been eliminated, the legs are able to lift poundage much greater than when trunk stability is a factor. 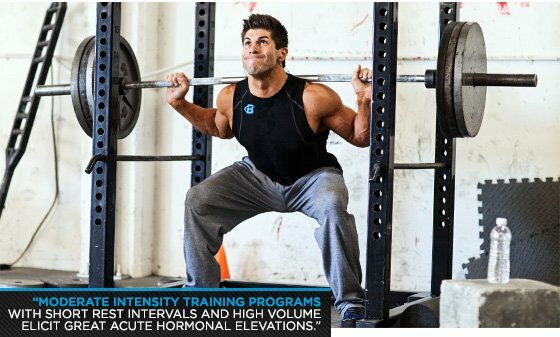 Ergo, the forces transmitted on leg muscles and joints are much greater than the body could naturally transmit during the squat.11 This potentially puts the hips, lower back and knees at much greater chance of injury because of the artificially heavy loads the kinetic chain is forced to handle. The core does not have to stabilize the weight. Numerous studies have shown that not only are squats safe, but are a significant deterrent to knee injuries. Squats increase stability in the knee by increasing strength in the muscles around the joint, along with strengthening tendons and ligaments. A squat requires the athlete to extend the knees and hips, while the leg press requires an athlete to extend the knees, but the hips are perpetually in flexion through the entire movement. The leg press is considered a compound movement, as is the squat. The leg press is closer to a single joint movement than the squat. However, much more weight is lifted in the leg press. Traditionally, compound lifts are the heaviest core movements, while isolation single-joint movements are not. Athletes in many cases are able to leg press more than five times what they can squat. Stabilization is important in sport and life. Increasing stability decreases the chance of injury in all activities. The squat increases stability, but the leg press does not. Because hip extension is eliminated, an athlete does not get to forcefully contract his/her hips like a vertical jump or most other powerful movements in sport.13 Most sports require some sort of hip extension. The squat trains hip extension, which the leg press neglects. Track coaches are quickly learning the importance of strength to body weight ratio concerning the squat. This is a great determiner of the athlete's ability to produce ground contact forces. 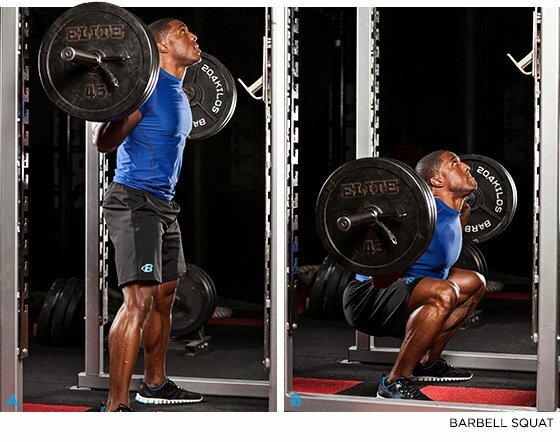 These studies clearly demonstrate the functionality of the squat. If an athlete chooses to use a leg press instead of the squat, likely he/she will have weakened hip extensors and weak hip extension in a chosen athletic endeavor. Another problem may be decreased functional strength for free-weight movements. Any experienced weightlifter will tell you the correlation between a squat and a leg press is virtually non-existent. Other potential downfalls of choosing the leg press over the squat may be decreased overall power output, decreased neural efficiency, shortened muscles, and decreased flexibility.9 The leg press in place of the squat could potentially teach the body to become dysfunctional by a lack of neuromuscular control, stability and potential retardation in motor patterns in sport. What does this mean? If you have no preexisting injuries and want to maximize the release of anabolic hormones without using illegal performance enhancing drugs, squat! If you want your muscles to grow, squat! What are the Pros Using? Bodybuilding is one of the few sports where maximum muscle hypertrophy is the primary goal. Bodybuilding supplements, contests, and magazines are a mega-industry. What do the experts who work in the trenches with these amazing athletes have to say? What do the most muscular men in the world feel anecdotally is superior, the squat or the leg press? Brian Dobson was the trainer of eight-time Mr. Olympia Ronnie Coleman, the largest champion competitive bodybuilder to ever take the stage. He also trained 2-time Arnold Classic Champion Branch Warren, who unquestionably has the largest and most muscular legs in bodybuilding today. Brian also trains professional bodybuilders via the Internet and trains many local and regional amateur champions. To top it off, Brian is the former training partner of Tom Platz, who many consider to have the greatest legs of all time. When asked about Platz's implementation of the leg press into his training protocol, Dobson remarked, "I remember seeing Tom Platz do 425x28 deep reps in the squat. Tom Platz was all about the squat. That was his deal; he never did leg presses." Brian went onto explain, "I have Branch and Ronnie squat every leg workout." While both Ronnie Coleman and Branch Warren do leg presses as a supplementary lift, their leg work revolves around the squat. Brian clarified, "The squat works the total body and is much safer than the leg press. I know plenty of people who cannot squat 300 pounds yet can easily leg press over 1000 pounds. My simplest answer is look at Tom Platz. He never did a leg press, but he'd squat until the cows came home." In the past, Brian and I have been training partners. In our bodybuilding phases, every leg workout begins with the squat. Over the past four years, I have watched Branch Warren and Ronnie Coleman begin their workouts with the squat. Many will still claim the leg press is superior when it comes to building quad mass. Four-time Mr. Olympia Jay Cutler had this to say on the subject: "Nothing builds quad mass like heavy free weight squats. I recommend all bodybuilders squat. "8 Let us see if science agrees with Jay Cutler and other champion bodybuilders. In the untrained group, Group 1, the results were almost a reflection of the trained group.5 The leg press utterly failed to recruit the ES, GM or BF to the degree the barbell squat did.5 The quadriceps were slightly more stimulated in the squat than in the leg press. Squats cause the desired natural anabolic hormonal response favorable to muscle hypertrophy. Electromygraphic activity was much greater in the lower body with the squat than the leg press. Champion bodybuilders and their trainers seem to agree on the superiority of the squat to the leg press for the purpose of hypertrophy. Science, along with the philosophies and anecdotal observations of people who are in the trenches on a daily basis seem to agree. The squat is superior to the leg press for lower body hypertrophy and overall muscle growth. People with larger amounts of muscle mass have higher metabolic rates. The more muscle one has, the more calories one burns, even at rest. Award winning ISSA certified personal trainer George Baselice added this on the subject of fat loss as it relates to squat: "The squat challenges your cardiovascular system to an extent unequaled by any other weight training exercise. The reason being the hypoxia effect, in which oxygen intake or use is temporarily inadequate. This breathless state is a tremendous metabolic stimulator. Squats will build an armor-clad heart and lungs, like a high-performance engine. "2 This is thought-provoking. The leg press is not totally evil. It offers certain advantages, like a simpler learning curve than the squat, although the squat is easy to learn with a good, qualified coach. The leg press may offer other advantages in rehabilitative clinical settings, for people with certain disabilities and other limiting factors, or as an accessory movement. It is tough to take any exercise seriously when televangelist Pat Robertson claims he can leg press 2,000 pounds, and 73-year-old Madeleine Albright stated in the New York Times she can do more than 400 pounds! Strength and conditioning coach, legend and author Mark Rippetoe, sums it up best: "There is simply no other exercise, and certainly no machine, that produces the level of central nervous system activity, improved balance and coordination, skeletal loading and bone density enhancement, muscular stimulation and growth, connective tissue stress and strength, psychological demand and toughness, and overall systemic conditioning than the correctly performed full squat. "10 Amen, Coach Rippetoe! Baselice, G. (2009, Sep. - Oct.). Long 'Lift' The King. Planet Muscle, N/A, 94-106. Kraemer, W., & Ratamess, N. (2005). Hormonal Responses and Adaptations to Resistance Exercise and Training. Sports Medicine, 35(4), 339-361. McBride, J., Blow, D., Kirby, T., Haines, T., Dayne, A., & Triplett, N. (2009). Relationship between maximal squat strength and five, ten, and forty yard sprint times. Strength & Conditioning Journal, 6, 1633-1636. Merritt, G. (2004, March). Cutler's quad quiz: Jay Cutler answers 10 questions about thigh building. Flex, N/A, 96-101. Rogers, L., & Sherman, T. (2001). Leg Press Versus Squat. Strength & Conditioning Journal, 23(4), 65-69. Wisloff, U., Castagna, C., Helgerud, J., Jones, R., & Hoff, J. (2004). Strong correlation of maximal squat strength with sprint performance and vertical jump height in elite soccer players. British Journal of Sports Medicine, 38(3), 285-288.